President Donald Trump's campaign and his family had several contacts with intermediaries for the Russian government during the 2016 campaign and the presidential transition. Those contacts are now under investigation by special counsel Robert Mueller. As President Trump celebrates Bastille Day in France with President Macron, additional information has surfaced about a meeting that took place between Donald Trump, Jr. and a Russian lawyer in June 2016. NBC News learned that a former soviet counter-intelligence officer also attended the meeting, something that had not been previously disclosed. March 2016: George Papadopoulos is named one of five foreign policy advisers to the Trump campaign and meets with people associated with the Russian government amid discussions to set up a meeting between Trump and Russian President Vladimir Putin. March 19, 2016: John Podesta, chairman of Democrat Hillary Clinton's presidential campaign, clicks on a malicious link sent to his personal email account. He later learns this gave hackers access to his account. The U.S. intelligence community and data from cybersecurity firms have tied the hack of Podesta's emails to Russia. March 31, 2016: Papadopoulos attends a meeting of the campaign national security advisers. Then-candidate Trump and then-Sen. Jeff Sessions attend the meeting. Papadopoulos tells the group he has "connections" that could help arrange a meeting between Trump and Putin. April 26, 2016: Papadopoulos meets with Joseph Mifsud, a professor in London, who tells him that the Russians had obtained "dirt" on Clinton, including thousands of emails. April 27, 2016: Papadopoulos emails a senior policy adviser in the Trump campaign, saying: "Have some interesting messages coming in from Moscow about a trip when the time is right." The New York Times has identified the senior policy adviser as Stephen Miller, who is now a top White House aide. Late April 2016: The Democratic National Committee becomes aware of the scope of the monthslong intrusion into its email systems by hackers whom U.S. intelligence agencies later linked to the Russian government. 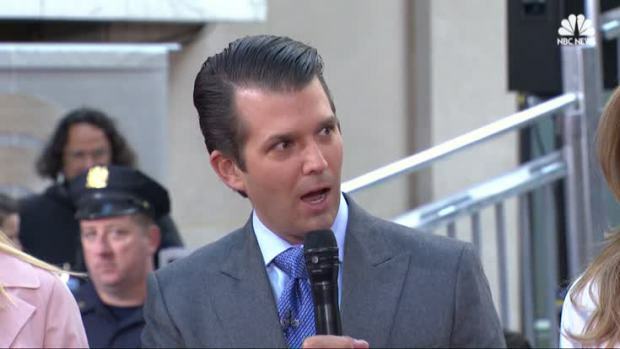 Donald Trump Jr. has acknowledged he was promised information about Hillary Clinton that might be helpful to his father’s presidential campaign in a meeting with a Russian lawyer. 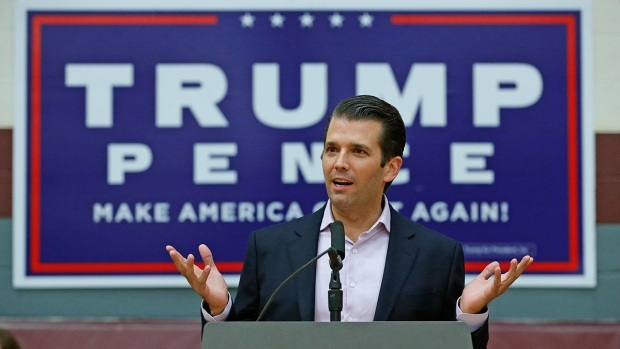 The lawyer, Natalia Veselnitskaya, gave “no meaningful information,” Trump Jr. said, adding that his father, President Donald Trump, had no knowledge of the meeting. May 2016: Papadopoulos continues to correspond with Russian intermediaries and pushes for a meeting between Trump and Putin. Trump campaign chairman Paul Manafort appears to shut down these efforts in an email. Early June 2016: Donald Trump Jr. exchanges emails with Rob Goldstone, a publicist representing a Moscow-based family who had partnered with the Trump Organization on the 2013 Miss Universe pageant in Russia. Goldstone tells Trump Jr. that the Russians have derogatory information on Clinton that would be "very useful to your father." Goldstone describes it as part of a Russian government effort to aid Trump's campaign. Trump Jr. responds: "if it's what you say I love it especially later in the summer." June 9, 2016: Trump Jr., Jared Kushner and Manafort attend a meeting at Trump Tower in New York with a Russian lawyer named Natalia Veselnitskaya, who promised to provide the Trump campaign damaging information about Clinton. June 12, 2016: WikiLeaks founder Julian Assange says his website has obtained a batch of emails related to Clinton and he plans to publish them. Mid-June 2016: The CEO of Cambridge Analytica, a data firm seeking to work for the Trump campaign, reaches out to Assange asking if WikiLeaks would share the Clinton information. Assange turns him down. July 2016: Trump becomes the Republican nominee for president at the party's convention in Cleveland, Ohio. In a speech the following week, Trump encourages Russians to release hacked Clinton emails. FBI opens an investigation into the Russian government's attempt to influence the election, including whether members of Trump's campaign are involved. Donald Trump, Jr. has released emails detailing his meeting with a Russian attorney who promised compromising information on then-Democratic candidate for president, Hillary Clinton. He said he released the exchanges "in order to be totally transparent." September 2016: Trump Jr. begins correspondence with WikiLeaks over Twitter direct messages. Oct. 3, 2016: WikiLeaks asks Trump Jr. to push a story about Clinton's comments on wanting to "just drone" Assange. Trump Jr. replies that he had already done that and then asks, "What's behind this Wednesday leak I keep reading about?" The copies of the messages released by Trump Jr. don't contain a response. Oct. 7, 2016: Hours after The Washington Post released a video of Trump bragging about grabbing women without their permission, WikiLeaks begins releasing emails from Podesta's private email account. Oct. 12, 2016: WikiLeaks tells Trump Jr. that it's "great to see you and your dad talking about our publications." WikiLeaks also passes along a link to a searchable database of the hacked information, saying: "Strongly suggest your dad tweets this link if he mentions us." Trump Jr. does not appear to respond, but 15 minutes later, his father tweeted: "Very little pick-up by the dishonest media of incredible information provided by WikiLeaks. So dishonest! Rigged system!" November 2016: Donald Trump wins presidential election. Jan. 6, 2017: The NSA, CIA and FBI release an intelligence assessment concluding that the Russian government interfered in the 2016 presidential election in an attempt to hurt Clinton's candidacy and help Trump. The agencies also concluded that Russian military intelligence provided hacked information from the DNC and "senior Democratic officials" to WikiLeaks. WikiLeaks has denied that Russia was the source of emails it released, including those from Podesta's private email account. 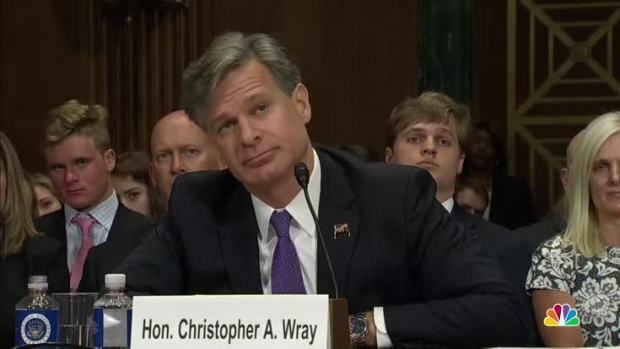 FBI Director nominee Christopher Wray testified to the Senate judiciary committee June 12, 2017, that Donald Trump Jr.'s June 2016 emails about a meeting with a Russian lawyer are "the kind of thing the FBI would want to know." January 2017: FBI Director James Comey, who was overseeing the ongoing investigation into Russian meddling in the 2016 presidential election, briefs Trump on contents of a dossier that contains salacious allegations about him and his campaign. Trump is inaugurated as the 45th president of the United States. Papadopoulos is interviewed by the FBI about his contacts with Russians. October 2017: Papadopoulos pleads guilty to lying to the FBI about the nature of his contacts with Russians during the campaign. Nov. 13, 2017: The Atlantic publishes private message exchanges between Trump Jr. and WikiLeaks during the campaign. Trump Jr. then releases copies of the communications on Twitter.